I know, I know. We’re all wearing many hats now. Multiple revenue streams are one way people cope with the challenge of today’s economy. We’re afraid to turn down business so we try to be everything to everybody. But people don’t hire generalists, they hire experts. You need to focus and specialize now more than ever. Each business or revenue stream you take on in your life must be focused with it’s own, separate social media presence or you’re going to confuse your customer and they’ll run away. “Umbrella branding” is a strategy that huge multinational businesses use — it’s the umbrella that covers all of their smaller brands. For example, GE is really a defense contractor when you get down to it, but their brand focuses on light bulbs: “We bring good things to light.” GE’s umbrella branding tags include: “GE: Brilliant Machines,” for their hospital equipment and “GE: Imagination at Work” for industrial equipment. 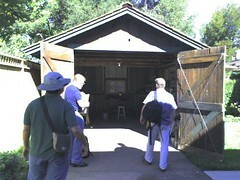 Or consider Hewlett-Packard, (HP). Did you know HP makes LED light bulbs for cars, components and about 10,000 other products? I know, because I worked for HP for several years and sat in meetings where we wrestled with this problem. Every one of those 10,000 product managers with a product at HP wants a press release and a press tour for their product, but only a few, select, “front runners” and stars get chosen to represent the overall brand. In other words, the products that are most interesting get the PR. When we think of HP, we usually think of the front runner products like: “Ink Jet Printers.” Or: “Innovation in the historic HP garage.” This was condensed ino one word, the HP brand: “Invent.” This is the HP umbrella brand. Now if HP and GE can’t afford to be all things to all people in their branding, you, Joe Schumuckatelli from Pocatello, Idaho sure as heck can’t afford multiple brands. But small businesses and start-ups almost always try to have multiple product lines, spin off new stores, create new catchy taglines for all of their offerings, address multiple markets and even have multiple websites and logos. What a mess. If you can’t remember all of your brands, products and taglines — do you think the customer can? In my personal experience, any business brand (or personal brand) trying to be too many things is doomed to failure. I have see this in the high tech industry where start-ups with less than $1 million in funding will attempt to brand multiple products and serve both the B2B market and the consumer right out of the gate–confusing the investors, press and customers alike. Create your personal umbrella brand. What makes me tick? What is at the core of every major step I’ve ever taken in my life? It will help to get feedback from friends, clients and family and step outside yourself to ask this question. Tap deeply in to your core life purpose. When you clarify your life purpose and articulate it in a mission statement, you are on the way to creating a Personal Umbrella Brand that will work for your focus for years to come, even when it changes. Case Study: A corporate organizational management consultant who now also does personal organizing and “downsizing” for individuals and small businesses. In your website, build your overall brand that ties it all together as your summary statement, making sure to use key words that people will search for in Google when they want to find you. This “elevator statement” is the most important thing you’ll do so give it time and bounce it off friends and clients. These key words create Search Engine Optimization or “SEO,” so use them often in articles on your website. Use pull down menus on your website to create sub-categories for specific lines of business. 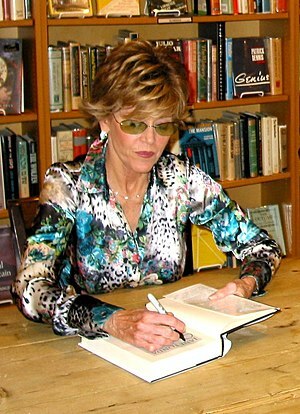 Jane Fonda at a book signing, 2005. If you’re already abundant and famous you can afford to create multiple brands and hire people to build all those websites and fan pages for your books, movies, exercise videos, non-profit philanthropic projects and political endeavors. Otherwise, focus your brand. If your businesses are wildly disparate, you should build a separate brand, website and Fan page community for each business — but trust me, this will seriously tax your time and focus unless you are Richard Branson or Jane Fonda and can afford teams of people to manage all of this for you. So if you have the fame and resources of Jane Fonda, go ahead and build multiple brands. 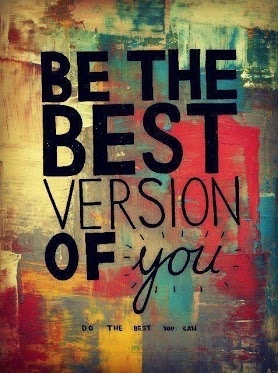 Otherwise, focus your personal brand. For many of us, especially if we’ve been working for two decades, our LinkedIn profile is all over the map. What do all these jobs add to? What is the ultimate focus that ties all this life experience together into your life purpose? Find the key words that clients or employers are searching for, and build those key words into your personal brand. If your signature line or title says you have six careers, which one do I hire you for today in 2013? Which one is your primary revenue stream? Nobody is an expert in 6 things. Focus your personal brand. When I see 5 careers in a LinkedIn profile, email signature line or Twitter bio I think: “She is less than 20% at each of these things.” I want to hire the person who is 100%, don’t you? Focus your personal brand. I don’t want a floor wax that’s also a dessert topping — I want an eco non toxic wax for hardwood floors. I don’t want a dentist who is also an auto mechanic — I want a cosmetic dentist with an office within walking distance from my house. Use a clear mission statement in your signature line, and if you have multiple lines of business, add a separate URL for each one. Build a separate email address for each business–it’s free in Gmail. What is my business — and what are my passions? Yes, like most people with a life outside of work, I’ve done a lot of things that I’ve been paid to do — this includes being a backup singer on some CDs, art curator, remodeling and flipping houses, stage manager and emcee for the Green Festival, art model, on stage storytelling performer, vegetarian caterer, producing events and yoga conferences, journalist, aromatherapist, writing a book about my “Eat, Pray, Love” journey in the south of France, etc. etc. I took a stab at starting businesses in all of these areas but generally, I ended up investing more than I earned …therefore they are hobbies. My business is promoting things. I have found a happy medium that feeds my soul by promoting things that are my passions — technology that helps people collaborate, events that teach healthy lifestyles, solar energy and green ideas. My passions, aka hobbies, however, don’t belong on my LinkedIn profile, my professional website or my email signature line unless I want to look like a flaky new age dilettante. I do get a lot of clients from the people I met while doing my hobbies, and they feed my soul, so I indulge in my hobbies on my personal Facebook page and Pinterest or by taking on volunteer roles or “pro bono” clients in these niches and highlighting them on LinkedIn in the volunteer section at the end of my profile. Examine your market niche and do research on the competition. For example, for one of my clients, a green talk radio host, she has discovered that there are no competitors at all for women representing the ecological and green movement. The door is wide open for her to take a thought leadership position and own that category as an author and media personality and we’re working on that together. For my business, I did a search in Twitter and noticed there are 181,000 social media gurus. 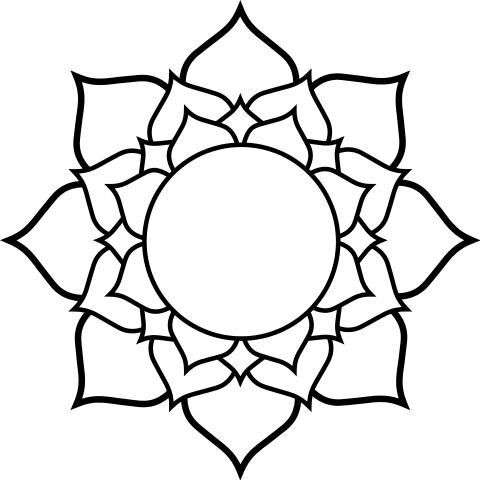 But very few focus on the LOHAS, green or sustainable market — that niche is wide open for thought leadership. Focus your photo and banner. Even though the Internet is “global,” few businesses really are. If your clients are from a specific geographical region, put that in your mission statement and build listings on Yelp, Yahoo, Google, and other local listing services to ensure you show up in local searches. It’s easier to be a big fish in a small pond — so consider focusing your brand to a region with the least number of competitors, or even moving to a region you can own and dominate. That region is a keyword that is crucial to your SEO for your website, LinkedIn and your Twitter bio–be specific so customers can find you. Focus and build thought leadership with content — and real world examples. Thought leadership is a commitment to leading a category and curating content in that category until you are synonymous with that category. (Tim Ferris owns the “4 Day Work Week.” Don Miguel Ruiz owns “The Four Agreements.” What do you own?) Yes, it’s tedious. Yes, it’s not as much fun as being a dilettante — but it helps you stand out and build authoritiy, page rank and SEO. 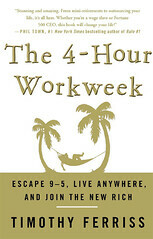 “The 4-Hour Workweek” author Tim Ferris is now the 4 Hour Anything Personal Umbrella Brand and he owns it. What do you own that is unique to you and you alone? Another client is a river rafting guide and also a massage therapist. I convinced her to drop the massage therapy from her river rafting website and build a new site for that sideline. It’s distracting to think of the relaxation of a massage and the adrenaline rush experience of river rafting under the same brand. Her new brand tagline is: “Life is a river — dance with it!” This reflects her personal passion in dance, and the fact that every river trip has live or DJ dance music, making them very different than mainstream river rafting trips. Other tag lines that spin off this theme will include: “Life is a river, flow with it!” and “Life is a river, dive in!”) The new card and website emphasize “flow” with curving fonts. There are hundreds of Esctatic Dance events and hundreds of river rafting trips — but she owns “Dance with the River”. When you focus your brand, you will find that not only will your credibility with clients improve, but your SEO, website traffic, Klout and Peer Index scores will soar because these scores reflect the consistency of posting on a single topic area and building thought leadership in that category. As your Klout improves, clients and customers will call, and you will be getting inquiries from the news media looking for authorities to quote in their stories, and speaking engagements. When you focus your brand, you won’t have to search for clients — they’ll finally be able to find you! Next postIs your LinkedIn profile embarrassing? Yes, I hope to follow up on my “Will you please focus your personal brand?” post — it’s one of the most popular I’ve ever written so far. What would you like me to cover? Hello to every , as I am in fact eager of reading this blog’s post to be updated on a regular basis. I’m gone to telkl my little brother, that he should also pay a quick visit this webpage on regular basis tto take updated from mot recent news update. would be the best course of action. The businesses that are listed on such applications can let the company grown and increase in popularity amongst users. Otherwise, if your site is getting hosted by Australian company and its Servers are located somewhere in U.
I believe that you should publish more on this subject, it might not be a taboo matter but typically people do not speak about these topics. blog and would like to learn where you got this from or exactly what the theme is called.